It looks like Germany-based hasn't encountered the same market limitation which led its competitor Citia to pivot from serving ebook consumers to crafting catalogs and websites earlier this year. In this time-pressured, distraction-filled digital world we live in, finding the time to sit down and read a good book from cover-to-cover can be a challenge. This is one opportunity Germany-based startup Blinkist has been keen to exploit, with its abridged e-book service that gives you the gist of titles in around 15 minutes or less. Today, it’s unveiling a completely free “Blinkist Basic” tier, that lets you read one pre-selected book each day. And in a move to open up to even more readers, it’s also introducing a Premium subscription option for $79.99 per year, bringing in new audio versions of the book summaries, read by professional narrators. Available on iOS, Android, and the web, Blinkist offers a catalog of summarized non fiction books which can be read in 15 to 20 minutes. Blinkist has over 500 titles in its catalog, including Richard Dawkins’ The Greatest Show on Earth, Barack Obama’s The Audacity of Hope, and the 2005 classic Freakonomics, and today it's adding 50 audiobooks (new titles are being added at a rate of around five each week). 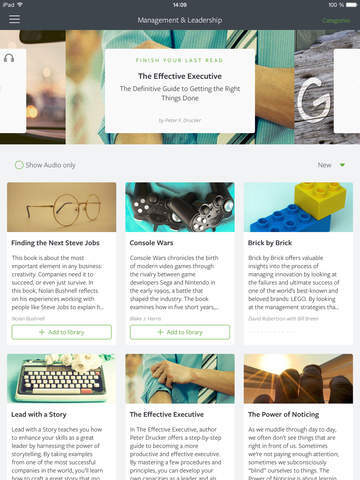 This is a natural expansion for Blinkist which will open it up to a new customer base: readers who prefer to listen to their books. "Audio has been the most requested feature, because a lot of people find it easier to listen as they can fit it in their day more easily," explains Blinkist CEO Holger Seim. "Eighty percent of people asked us about this feature on our last trip to Silicon Valley. I believe audio will be a real game-changer for us." Blinkist is also launching a free tier today. While this startup has always offered a free 3-day trial, it now also lets users read one pre-selected summary each day at no cost. What's more, Blinkist has also added a premium tier which offers exclusive access to those newly added audiobooks as well as special features (send to Kindle, Evernote sync) . The regular subscription still costs $50 a month, while the premium service costs $80 a year. Launched at the beginning of 2014, continues to offer text-based summaries of non fiction titles. Unlike Wikipedia, titles in the Blinkist catalog are written by experts and carefully curated for accuracy and clarity. The servicce claims 35,000 users, with 2 million summaries read.